Are you wondering which is the best school for you? You can make your choice based on location, cost, the subject you are interested in, or all of those methods. Use this list of resources for assistance with finding, choosing, and applying to colleges. College Scorecard: This tool includes information about a particular college’s cost, its graduation rates and the average amount its students borrow. It is designed to help you compare colleges and choose one that is well-suited to your individual needs. US News College Rankings: This is a list of the US News & World Report college and university rankings, which are calculated yearly based on factors including graduation and retention rates, undergraduate academic reputation, and faculty resources. They also provide lists of colleges designed to suit certain types of students. CollegeXpress: This is a college search tool. You select criteria to limit the search, and it returns a list of colleges you might be interested. For example, if you search for a public school in Michigan with an Aerospace Engineering degree, the resulting list contains the University of Michigan and Western Michigan University. 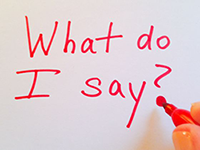 Read more: 10 Ways to Decide Which College to Attend, More Than One College Acceptance? How Do You Decide? Common Application: This application is used by more than 700 schools, and it is fairly likely that at least one school on your list will accept the Common Application. For more tips on the Common App, check out my blog post here. Anatomy of a College Application: This walks you through the basis of what is included in the college application process. From listing your name, to explaining your favorite extracurricular activity, your application is how colleges get to know you. 850+ Schools that Don’t Require the SAT/ACT: If standardized testing isn’t your strong suit, that’s okay! More and more schools are recognizing that testing isn’t the only indicator of a strong student, and they are opting to be “test-optional” schools. This means you are welcome to send them your test scores, but they are not required. 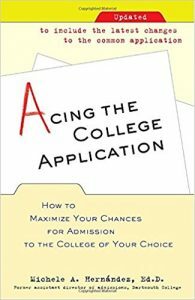 Acing the College Application, by Michele Hernandez (2002) The author of this book is a former assistant director of admissions at Dartmouth, so her writing offers insider knowledge about the Common Application, asking for letters of recommendation, and writing your application essay. This book is especially for students applying to selective or highly selective colleges. 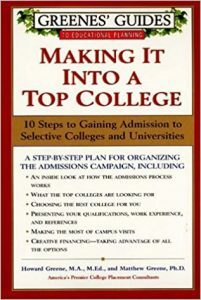 Making It Into a Top College, by Howard R.Greene (2000) This guide to applying to selective colleges includes sections like “Making the most of campus visits”, “Presenting your qualifications, work experience, and references”, and “What the top colleges are looking for”. 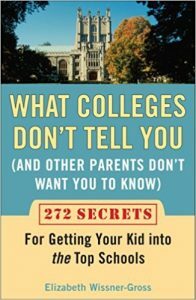 This book has 272 “secrets” that are designed to help you get your student into their top choice of colleges. It is a resource for parents trying to help their children, rather than for the students themselves.